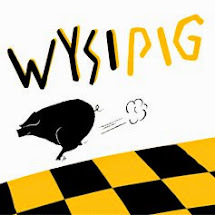 Forget the sport, this Saturday is Wysipig’s monthly open day. All the great Wysipig pork and beef products will be on offer and the specials this month will be food for the barbeque, sausages, ribs and marinated pork steaks. Visitors can view the vintage tractors and meet some of the pigs and cattle. Well after such great weather all week we woke up to a wet start. Not to worry we've lots of nice things in the shop, Kevin's beef burgers are great, just the thing to go with sport on the TV and if it brightens up get the BBQ going. The gift shop is open and there's plenty of room for campers.